Colorado House District-55 Representative Ray Scott (R) of Grand Junction introduced his bill, “Local Accountability for School Districts (HB 1202)” to the House Education Committee yesterday. Representative Scott’s designed his bill to provide a legislative mechanism for school districts wanting to opt out of onerous state and federal testing mandates, and implement their own, locally-designed, assessment tools. In the introduction to the bill, Ray Scott cites the educational cost of a high number of school days spent in assessment as the number of instruction days on school calendars is trending downward. A high quality, rigorous assessment system should the primary focus of assessment practices. Uniformity for uniformity’s sake should not trump a school district’s goal of exceeding minimum state standards. Summative – at the end of learning, assess degree of mastery. The majority of these assessments occur at the classroom level, with common assessments at the school level and state mandated assessments at the district level. Teachers employ a wide variety of strategies to assess student learning in meaningful ways and help build an informative student body of evidence. Quality Assessment – meet or exceed the quality assessment standards reflected in the State’s assessment review process. Technical Rigor – meet or exceed the appropriate technical rigor requirements as reflected in Standard 6 of Educator Effectiveness. Public accessibility to school and district results on the balanced assessment system. The school district would annually administer the state PARCC performance assessments in select grades (3,8,10), as well as Colorado ACT, providing continued accountability and statewide comparability. Representative Scott’s bill also addresses “parent refusals” which place schools in the position of giving zero scores to those students who, for a variety of reasons, refuse to participate in protracted standardized assessments. HB 1202 exempts schools and districts from having to include those zero scores in their overall achievement statistics. Ray Scott’s bill follows on the heels of the “Colorado Mom’s Bill,” SB-14 136, introduced by Senator Vicki Marble (R), Senate District 23, which unfortunately failed to progress in the State Assembly. SB-14 136 would have delayed the implementation of the highly controversial “Common Core” standards in Colorado for one year, giving the State Board of Education as well as school districts time to review and prepare for its intrusive mandates. The Colorado Mom’s Bill would also give school districts a way to opt out of the related testing required by the new state and federal standards. There is a growing uneasiness in Colorado regarding the impact of Common Core and its related assessments. Pressure is building on Capitol Hill to get legislators to pay attention to the concerns of teachers, and administrators already struggling under huge administrative burdens in their schools, and the citizens and parents who understand that the bureaucratic takeover of local learning never has a good outcome. Ray Scott, Colorado Representative from District 55 in Western Colorado, has a reputation of being a fierce advocate for energy industry jobs on the Western Slope. He has worked with various organizations, including those in the energy sector, to improve environmental standards and practices to make exploration and drilling viable in environmentally sensitive regions of the state, Representative Scott has also gained significant credentials as an authority in matters of water use and environmental conservation. HB1223, offered up by Ray Scott in 2011, was designed to balance the representation of energy interests in Colorado by ensuring that the board of the Colorado Oil and Gas Commission (COGC) would have members from diverse regions of the state. This was not just a push for energy sector jobs in Western Colorado. HB1223 ensured that the differing environmental, agricultural, and economic needs in Colorado would be considered in important policy decisions by COGC. Well into his second term in the General Assembly, Representative Scott’s balance and fairness regarding energy, jobs, and environmental conservation, has earned him recognition from the leaders of the opposition party. The Democrat Speaker of Colorado’s House of Representatives, earlier this month, appointed Ray Scott to the Council of State Governments-WEST (CSG-West) Water and Environment Committee. According to a press release from Representative Scott’s office, the CSG-West Water and Environment Committee, “provides western legislators a forum to discuss growing and competing demands on Western water and the environment.” CSG-West collaborates with the Western Governors Association as well as other governmental and private organizations to plan and implement strategies for development that protect the environment and create jobs in the West. Representative Scott has made it clear with his appointment to this important committee that energy sector development and jobs, and environmental conservation and clean water are not mutually exclusive. As a Holy Week or Passover exercise, consider Intercultural Communications instructor Deandre Poole’s mandate that students write the name JESUS on a piece of paper, place it on the floor and stomp on it. Highly religious student Ryan Rotela refused, and told the instructor he “was deeply offended by what you told me to do” saying “if you were to stomp on the word Jesus, it says the word has no value.” Rotela also complained to Poole’s supervisor. Subsequently, Rotela’s college (Florida Atlantic University, Davie campus) said this class exercise was “insensitive and unacceptable.” After this formal apology, FAU brought separate charges against Rotela and denied him access to his classes. With that background consider a legal question. Do Deandre Poole and FAU have a fiduciary relationship and duty to protect students, including Rotela? Here’s why the question is important. A fiduciary duty may exist between Rotela and both Poole and FAU, the two dominant parties. FAU’s words of apology seemingly admit an environment lacking “openness, tolerance, and civility,” as advocated by the American Council on Education. If the relationship exists and Poole or FAU violated their consequent duty to students, then Rotela (and any others similarly maltreated) may have a lawful complaint. Colorado legal cases include seven figure judgments when fiduciary duties are violated, so this isn’t just legal gobbledygook. Gospel accounts of Jesus’ final days list the legal proceedings he endured, before the Sanhedrin, Herod and Pontius Pilate. Analyzing the accounts and known legal requirements for the three, all violated their established rules. Both Jewish and Christian traditions describe the consequences of rulers behaving unjustly. We cannot judge Rotela’s guilt or innocence regarding violating student conduct rules. In a spirit of Christian forbearance, we should hope both that Rotela behaved properly and that FAU is not penalizing Rotela for his lawful actions. Colorado’s leaders, both political and educational, should behave in good faith and honesty – admitting they owe a quasi-fiduciary duty to all Coloradans and all students. Braving unseasonably cold and blustery weather, a robust crowd of about 650 gun-rights supporters lined the streets and gathered around the student center of Colorado Mesa University today in protest of Governor John Hickenlooper’s appearance at Club 20. As part of its legislative forums held on the campus of CMU in Grand Junction, Club 20 hosted Governor Hickenlooper as well as other political figures who have close ties to the Western Slope such as District 3 United States Congressman Scott Tipton, District 55 Colorado Representative Ray Scott, and District 54 Colorado Representative Jared Wright, among others. Liberal Democrat John Hickenlooper is a fish out of water in the company of Colorado’s representatives from the conservative western counties, but with the citizens of Mesa, Montrose, Garfield and other surrounding counties, the governor is a fish in hot water. 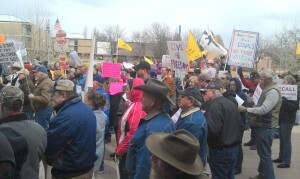 The protest/rally which was organized by Rocky Mountain Gun Owners, Mesa County Patriots, Freedom Colorado and other Western Slope grassroots organizations, attracted numerous men, women and children who have not previously been involved politically. The political affiliations of these protesters was not fully clear, but their passion for personal liberty was on full display, and it appears they take the threat posed by Democrat legislators in Denver very seriously. The organizers of the rally had hoped to surround the student center at CMU to ensure that when Governor Hickenlooper arrived to prepare for his speech, scheduled for 12:30 p.m., he would see with his own eyes and hear with his own ears the disapproval by citizens of the gun control measures he signed into law just days ago. Hickenlooper, whose base of opposition, politically and philosophically, is concentrated in the Western Slope counties, most likely knew he would be met with a cold shoulder and opted to sneak into the Club 20 meetings before protesters gathered outside. The most prevalent theme echoed on the signs carried by those protesting Governor Hickenlooper’s gun control laws can be summed up in a few short phrases, “one-term,” “recall the governor,” and “impeach.” The chances that Hickenlooper, who still has a lot of support among Democrats and moderates on the Front Range, will be recalled or impeached are slim. But 2014 is just around the corner and there is no doubt that grassroots conservatives in Colorado will have a strong candidate to challenge him in his run for a second term. The Western Slope is one of the primary focal points of opposition to Governor Hickenlooper. Is it possible that the candidate who will challenge him in 2014 will also arise from the Western Slope? The Colorado State House District 55 incumbent, Ray Scott, has been hard at work for the past several months campaigning for a second term. In retrospect however, one might say his opponent, Democrat lawyer Dan Robinson of Grand Junction, has been the best thing going for the Ray Scott campaign. Robinson, a seasoned candidate and entrenched Liberal who previously ran for county commissioner in Mesa County, may have bitten off more than he could chew when he became the Democrat candidate for Colorado D55. His problems began when a document from the 21st Judicial District chapter of Access to Justice surfaced revealing his penchant for performing pro-bono legal favors for undocumented aliens. Robinson magnified what would have been a minor controversy when, during his debate with Representative Ray Scott at Club 20 in September, he denied ever doing pro-bono work for illegals. Fast forward to the 2nd Amendment Forum on October 13. Dan Robinson’s problems really began to pile up when he lied yet again. When asked about the amount in campaign contributions he had received from the Democrat Party in Mesa County, Robinson claimed he had received none. The Secretary of State’s office “tracer” website, which reports campaign funding across the state, revealed that the Democrats in Mesa County had actually donated $6,100 to Robinson by the date of that forum. There has been a snafu at the Post Office which has resulted in Dan Robinson’s campaign mailbox being closed prematurely. For that reason, some folks who may have contributed to Dan’s run for Colorado State Representative from District 55 may see their checks returned. Additionally, Dan is sitting on a couple of excellently produced television commercials and radio spots — but unless he can raise more money, they may never see the light of day. It is crucial for us to get Dan’s voice out there in these last days of the election. Please consider donating to Dan’s campaign today! The email goes on to characterize the closing of Robinson’s campaign mailbox as a “kerfluffle.” One may speculate that the mailbox was gathering dust and the Post Office needed the space, or that maintaining the mailbox was costing more money than the campaign was bringing in. Either way, neither Robinson’s experience in his previous campaign nor his career in litigation served to help him overcome the chronic incompetence that has plagued his fight for a seat in the State House. Voters in Mesa County are probably waiting with bated breath to see those “excellently produced television and radio spots” that the MCD email claimed Dan Robinson is “sitting on.” It might be wise, however, for Robinson to keep sitting on them, right where they are. Chances are, he won’t be sitting in the State Capitol anytime soon. It seems the Democratic strategy is now to call everything the Republicans say a lie. and then ignore it when the facts can’t back that up. The Democratic Party base (and if you have to pander to them this late in the game, it’s NOT GOOD) ate it up with a spoon. Not so everyone else. Ryan was very much a wonk. Biden was very much a wanker. And I think that most of the Dem strategy for this debate was to try and get Ryan to lose his cool. That failed miserably, Ryan looked like the adult, Slow Joe came across as that smirking punk everyone knows from school who would laugh at anything he didn’t consider “cool”.